Hundreds of thousands of undocumented immigrants face uncertainty as the federal Deferred Action for Childhood Arrivals program, or DACA, is slated to end in early March. What are the potential implications for students, K-12 schools, and higher education? What kinds of questions should education reporters be asking in their communities? The Education Writers Association teamed up with the Student Press Law Center to help busy journalists cover the impact of developments concerning DACA, a program President Obama created to temporarily shield some young people brought to the United States illegally by their parents. The Trump administration last fall announced plans to phase out DACA, giving Congress six months to act to restore the program. Now, lawmakers are considering ways to address the situation, but the outcome is uncertain. 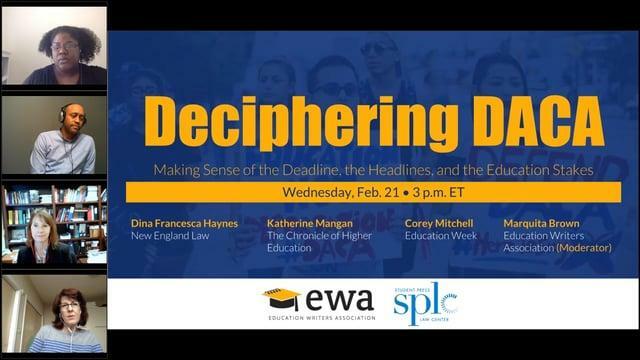 This webinar features two education journalists who have covered DACA issues in depth, and a professor at New England Law with expertise in immigration matters. The presenters will get you up to speed on the issues, help you localize the story, and offer tips to expand your source list (including with DACA recipients), as well as field questions from live attendees.